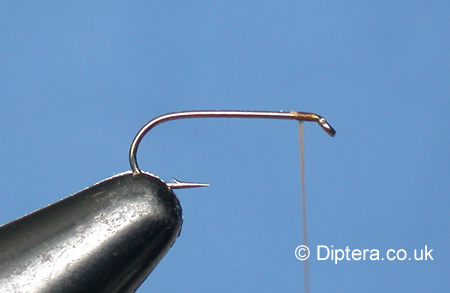 STEP 1 : Catch the thread onto the hookshank. STEP 2 : Take a bunch of natural pheasant tail fibres and catch them in tip first to the hookshank and run the thread down the body to a position opposite the barb. 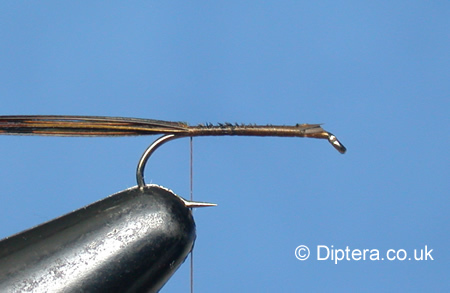 Make sure the thread on the hookshank is kept uniform. 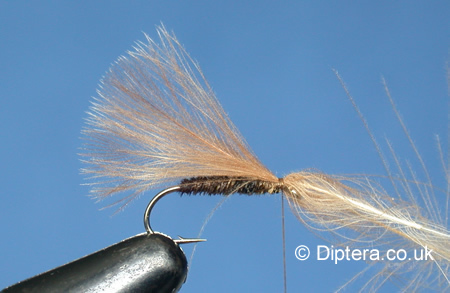 (The number of pheasant tail fibres depends on the hook size used). STEP 3 : Wind the thread back up to the eye. 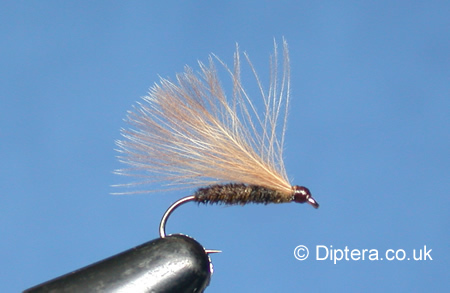 Using either hackle pliers or just pinching between your thumb and index finger wind the pheasant tail fibres up the hookshank, be careful not to cross any of these fibres. Secure the fibres about 5mm from the eye and trim the waste ends. STEP 4 : Take 2 Natural CDC Feathers and place them side by side, making sure that the tips of the feather are level. 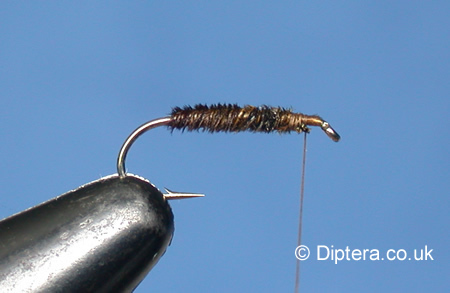 Catch them in at the thread position with firstly a single wrap of thread, adjust the feathers length so that the feather is about 1/3 the length of the hookshank past the hookbend. Now perform another 3 or 4 wraps of thread and trim the waste ends of CDC feather. STEP 5 : Now build a neat head with thread, whip finish and varnish the head 2 times.